For relief of occasional stress. 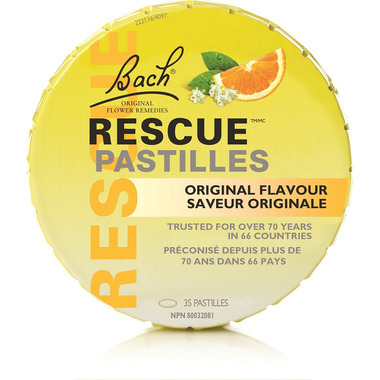 Bach Rescue Pastilles are ideal for coping with exam stress, driving tests, first day of school nerves, job interviews and high pressure environments. The funky tin with an easy "press on the lid" opening and closing mechanism. It is easy to take anywhere and with natural flavouring safe for use by the whole family. Directions: Chew one pastille as required. Active Ingredients: 5x of combined Rock Rose (Helianthemum nummularium HPUS ), Clematis (Clematis vitalba HPUS), Impatiens (Impatiens glandulifera HPUS), Cherry Plum (Prunus cerasifera HPUS), Star of Bethlehem (Ornithogalum umbellatum HPUS). Inactive Ingredients: Sugar substitute (sorbitol, isomalt, xylitol), gelling agent (gum arabic), natural flavor (elderflower, orange), glazing agent (vegetable oil, beeswax). Warnings: Keep out of reach of children. If pregnant or breastfeeding, ask a health professional before use. Excessive consumption may induce mildly laxative effects. May contain traces of gluten. Not recommended for pets. I like the taste of them, and I think they work for people with average stress/anxiety. They really do not come close to prescriptions for those bad days though. Soothing and enjoyed the taste. Very helpful. Nice change to have the lozenge. Have used the drops for decades. I find them very helpful when I feel a bout of anxiety coming on. I just chew one and a few minutes later I feel much more calmer and relaxed. I find these very helpful for days Iâ€™ve got some mild generalized anxiety and tension. Have repurchased a few times. I just find sometimes they seem a lot fresher and easier to chew (softer) than other times Iâ€™ve purchased. It can be hit and miss but when it works, it works. I find it helpful when I am feeling wound up. Taste is good. Helps with some forms of my anxiety some days but not 100% effective. Pleasant enough taste, but I didn't find these to ease my anxiety at all. Mind you, after looking into Bach remedies I learned other flowers were recommended for me, not the ones features in these pastilles. I love these! Great taste, texture, and long-lasting. The packaging is great too! I use them anytime I need to calm my nerves. I didn't find these worked at all for my Generalized Anxiety Disorder. It really helped me sometimes. These work great for anxiety. I use them when stressed out or having trouble sleeping and have noticed a difference. Not a huge fan of the artificial sweeteners in in though. These pastilles are so amazing and helpful under stressful situations and when I'm feeling any sort of anxiety. Highly recommended. My teenager loves these. Whenever he's feeling anxious, he'll pop one into his mouth & before long, he starts feeling better. My daughter in law, swears by this. Use it every time she has exams in university. It was a good stocking stuffer this Christmas. My daughter eats them like candy, which is fine by me! I love all the Bach line! I have quite a bit of anxiety and I find these help. Whether they act as a distraction, or actually calm you down I'm not sure, but I use them all the time. I got these for my boyfriend who suffers anxiety. Im not sure if they work but he swears by them. I like that they are all natural. Love the Rescue Pastilles when I need relief on the go! Just throw them in your purse without worry of spillage or breakage. They melt slowly, leaving your mouth fresh and hydrated. Pleasant taste. Not sure if it really calms but the chewing it might distract from the stress. Only minor thing is that it sticks to the teeth. Pleasant tasting, soothing. I found the texture rubbery...my only complaint. Does not work when dealing with stress, just taste like candy. Gives you something to chew on which might take your mind of your stress for a moment, but the same effect can be achieved with gum. Maybe the drops work better? These are great for those those stressful job situations. These have a pleasant, mild taste and work great when my son is feeling a bit on edge and anxious, they calm him down so he's able to concentrate or go to sleep. I love this product and the way I truly know it works was that when I was extremely anxious before driving lessons, I took one and it went away within 5 mins. I like the taste it's like a chamomile tea taste, mild yet sweet. I have GOT to add that this product due to the artificial sweeteners is NOT safe for dogs/pets!! Some people do give rescue remedy to their dogs for seizures, to help calm, BUT THIS IS NOT the one that is for pets. NO FOR PETS!! It ever says so on the label. Do your homework and research before using this product; it is pleasant for humans but could be deadly for dogs, so make sure you keep them stored safely away from pets. Excellent product, tastes very nice, chewy/pleasant. NO alcohol in this formula means safe for kids! My 14 year old with an anxiety disorder. He feels that this product helps him in stressful situations. I am going to order more for a plane trip! Helps to ease 'pre-flight' jitters. We were suprised how well this worked. It took the edge off of stressful situations. Easy to take, tastes good. Have purchased several since first buying.